Cultured stone has everything you could hope for in a unique application. This is a product made by man to look and feel like real stone without the weight . These products give the customer an endless choice of colors and textures. See the link to Owens Corning for some ideas. Seeing beautiful houses in magazines and in your neighborhood with stone bricks, walkways and other décor detailing will make you wonder on how much you need to spend to achieve the same regal look for your home. You don’t have to pay a fortune for stone or stone veneers because cultured stone is available here at Rainbow Acres Landscaping where we can make your own stone with cast concrete molds. A lot of homes or offices nowadays have been using cultured stone yet it is hard to tell these stones apart from stone veneers and others. Rainbow Acres Landscaping can copy the shape, size and texture of stone veneer, bricks, pavers, and a lot more to give your home or office a more exciting look. There are also some special cement colors and sealers that can be applied to achieve the exact coloring and surface treatment of a specific stone that you want to imitate. Many of the manufacturers today specifically make cultured stone for the home’s exterior as they can be used as sidings or in outdoor fireplaces. Rainbow Acres Landscaping can provide you with limitless selection of cultured stone. 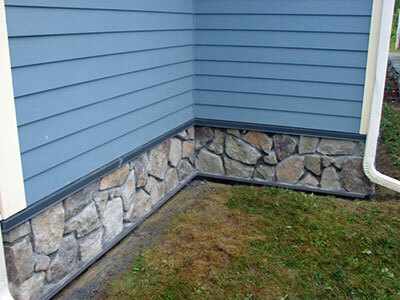 Cultured stones can be used for walls, trim, walks, patios and other application. This is an excellent addition to your already precious home. Undoubtedly, cultured stone is your last puzzle in making your home extra homey and more attractive. Aside from this obvious perk, cultured stone also offers great insulation, sound suppression and superior durability. Because of the technology employed in creating cultured stone, you are guaranteed that it is a very resilient and safe product. Created out of natural materials and binders, cultured stones are fire resistant. This is excellent news for homeowners who put their safety first. When used in landscaping, cultured stone will create magnificent effects in your landscaped area and little maintenance on these stones is required. Many homeowners have already put their trust on cultured stone and it is now your time to do the same. Create an inviting home for your family through these cultured stones and you will be astounded by the great outcome. Now that you have an idea on how to make your home more attractive, the next step is to find the right contractor capable of installing cultured store. Vermont has many capable contractors but no one can ever surpass the professionalism and top quality services that Rainbow Acres Landscaping provides to its customers. Our company is a residential and commercial contractor specializing in stonework installations. With us, you can achieve the realistic, natural, and low-cost benefits of cultured stone. Contact us now and bring new life to your home.